The correct title of this article is Building #19. The omission of the # is due to technical restrictions. 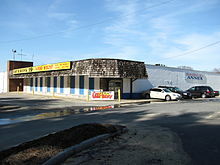 Bankruptcy; 2 stores reopened as "The Rug Department"
Building #19 was a chain of discount stores in New England that operated from 1964 until they declared bankruptcy in 2013. At the time of their bankruptcy they closed all 13 stores. The same family that owned the chain later reopened two of the former locations as a part of a new business, The Rug Department, that was limited to rugs and related merchandise. The closeout stores had been known throughout New England for selling an eclectic assortment of items at drastically discounted prices, as well as self-effacing advertising that made fun of the founder, Jerry Ellis. Many of the items were factory irregulars, discontinued models, post-expiration-date, damaged, or less than perfect in some other way, but some new merchandise was offered as well. The stores capitalized on the quick cash flow needs of other businesses, obtaining most of their merchandise from fire sales, overstocks, customs seizures, liquidations, and bankruptcy courts. Jerry Ellis (born Gerald Elovitz) founded the original store in 1964 with Harry Andler, when the two joined together to sell a stock of appliances. The original Building #19 was located at the former Bethlehem Hingham Shipyard, where the buildings were numbered, and the store retained the nondescript name on the building rather than pay for a new sign. Harry Andler was doing surplus and salvage business in the shipyard for several years. The unique combination of Ellis' advertising flair and Andler's expertise in finding and buying distressed merchandise accounts for the early success of the business. Aldler bought "good stuff cheap" and Ellis let everyone know about it with amusing advertising. In 1971, when the windows began to fall out of the John Hancock Tower in Boston, Jerry and Harry were offered, and bought the defective window panels that were scheduled to be replaced. This got the company national press and attention. In 1979, retailers Building #19 and Bloomingdales both appeared as contrasting locations in the movie Starting Over, starring Burt Reynolds, Candice Bergen, Jill Clayburgh, and Charles Durning. The movie was directed by Alan Pakula. In the 1980s, the original Building #19 moved to the former GEM (Government Employee Merchandise) building on Derby Street in Hingham, Massachusetts. Later, Building #19 1/8 opened in the old Stuart's store in the Harborlight Mall on Rt 3A in Weymouth, Massachusetts; still later that store was closed to build a Lowe's Store. The main store Building #19 moved from Derby Street in Hingham and was situated in Weymouth at the old Caldor/Zayre's/Ames building on Massachusetts Route 18. In 2002, Building #19 bought out the independent discount store Spag's in Shrewsbury, Massachusetts, and renamed the acquisition "Spag's 19". The store format and configuration were changed after the purchase, to more closely resemble the other Building #19 operations. However the store was closed in May 2013. The chain was known for its often self-deprecating humor, both in their advertising and throughout their store interiors. Their weekly ad circulars often featured caricatures of founder Jerry Ellis with a number of sarcastic captions, many of which were repeated in their in-store advertising. The early circulars featured the "free-spirit" Ellis sternly commanded to work harder by the "skinflint" Andler. As of 2012[update], Ellis still wrote most of the ad copy used in the ad flyers. Each Building #19 location offered free coffee with "free fake cream". Signs near the free coffee stand warned customers not to make fun of the poor quality of the coffee, because "someday you'll be old and weak too". Their price guarantee awarded a bottle of "Chateau du Cheapo" champagne if a competitor beat their price. In 2006, Building #19 put a cartoon in their President's Day advertising flier showing A-shirts (athletic style undershirts) labeled as being "Wife-Beater" shirts. Building #19 was criticized, and promptly apologized. Two years later, a flier poked fun at the 2006 controversy, and was similarly criticized. The main Building #19 store was located in Hingham, Massachusetts; other stores had a numerical fraction appended to their name (such as Building #19½, in Burlington or Building #19¾, in Norwood). Building #19 1/9, in Pawtucket, Rhode Island, used the old grandstand portion of Narragansett Park - a former horse racing venue that had closed in 1978. "Suffer a Little, Save a Lot"
"Support the three-day work week"
"Please leave with at least as many children as you came with"
On November 1, 2013, Building #19, Inc. and a number of affiliated companies voluntarily filed for Chapter 11 bankruptcy protection in the United States Bankruptcy Court for the District of Massachusetts. Founder Jerry Ellis said that the business had been "on a downhill slope for 10 years", and attributed its failure to Internet competition, overseas manufacturing, and improved fire protection of warehouses. The latter two factors reduced the supply of salvage and surplus products to sell, while increased competition caused the number of their store customers to drop. ^ Goodison, Donna L. (2001-05-11). "King of Cheap". Boston Business Journal. Founded in 1964, Building #19 is now a collection of 13 stores in Massachusetts, New Hampshire and Rhode Island. ^ a b c "Building #19: About Us". Building #19. Archived from the original on 2014-05-14. ^ a b "Profile: Building 19 Inc". Hoover's. ^ a b c d Luna, Taryn (November 5, 2013). "The fun runs out at Building #19". Boston Globe. Retrieved 2014-09-20. ^ Herman, Colman M. (January 25, 2014). "Bankrupt Building 19 reinvents itself as a rug store". Boston Globe. Retrieved 2014-09-20. ^ a b Ramos, Dante (November 17, 2013). "Building #19: Twilight of the mishap-based economy". Boston Globe. Retrieved 2014-09-20. ^ "Building 19 to buy Spag's". Boston Business Journal. 2002-10-09. ^ Nicodemus, Aaron (May 15, 2013). "Building 19 to Close Former Spag's Store". Telegram & Gazette. ^ a b Wojahn, Ellen (June 1986). "The Forces Of Conformity". Inc. Magazine. p. 119. ^ a b Derr, Greg (February 15, 2012). "Jerry Ellis of Building 19 still loves a bargain after all these years". EnterpriseNews.com. Gatehouse Media, Inc. Archived from the original on 10 January 2014. Retrieved 16 March 2013. ^ "Flier Describes T-Shirts As 'Wife-Beaters'". WCVB-TV. 2006-02-21. Archived from the original on 2012-03-06. ^ "Building 19 Again Apologizes For Ad". WCVB-TV. 2008-04-16. Archived from the original on 2012-03-06. ^ "Good Stuff Cheap (or Free) The Building #19 Story". The Shoestring. 2003-10-17. Archived from the original on 2012-07-16. Retrieved 2009-05-29. ^ "Building #19 – New England Discount Store Chain – Files Bankruptcy, Plans Liquidation and Going-Out-of-Business Sales". Chapter 11 Cases. November 2, 2013. ^ Herman, Colman (November 12, 2013). "Building #19 owner looks back, ahead". Boston Globe. Retrieved 2014-09-20. Vega, Gina (May 2007). "Business succession at Building #19: overall, it is better to be the father than the son". Entrepreneurship: Theory and Practice. 31 (3): 473–488. doi:10.1111/j.1540-6520.2007.00183.x.